Dr. Calvo’s research focuses on non-receptor protein-tyrosine kinases (PTKs), which are important in signal transduction from cytoskeletal structures. He is also intesested in the EGFR family of receptor tyrosine kinases as they relate to solid malignancies. He is actively pursuing the use of quantitative PCR and biochip technology to determine mRNA levels of these various kinases in carcinomas of the colon, breast and melanomas. 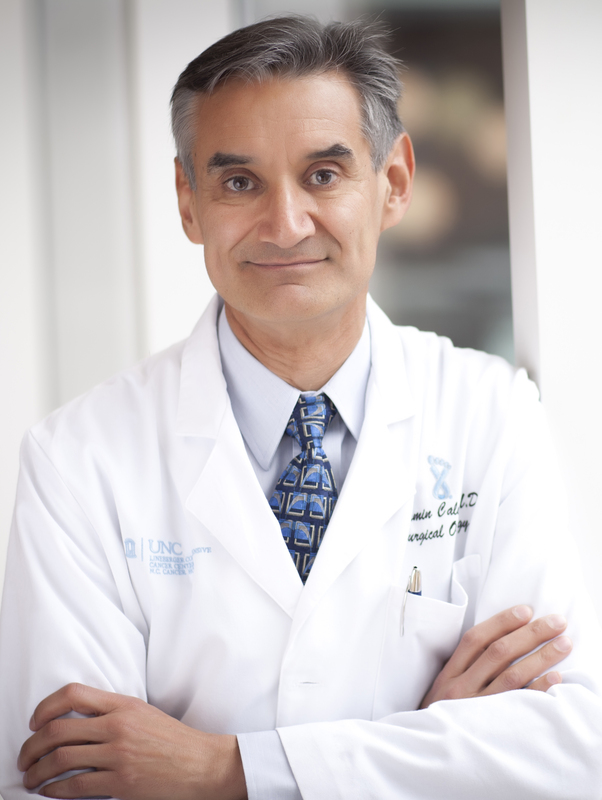 Dr. Calvo has been actively involved in the development of new techniques for cyroablation of liver metastases from colon cancer as well as participating in a number of active multi-modality therapeutic programs for patients with colon and rectal carcinoma. Dr. Calvo is taking the lead, in conjunction with Dr. Mark Graham from Medical Oncology and Dr. Robert Briggaman from Dermatology, in developing a melanoma program at UNC. Their work will focus on the development of combined chemotherapy and biologic treatments along with novel immunologic strategies that will include vaccine and antibody based efforts.